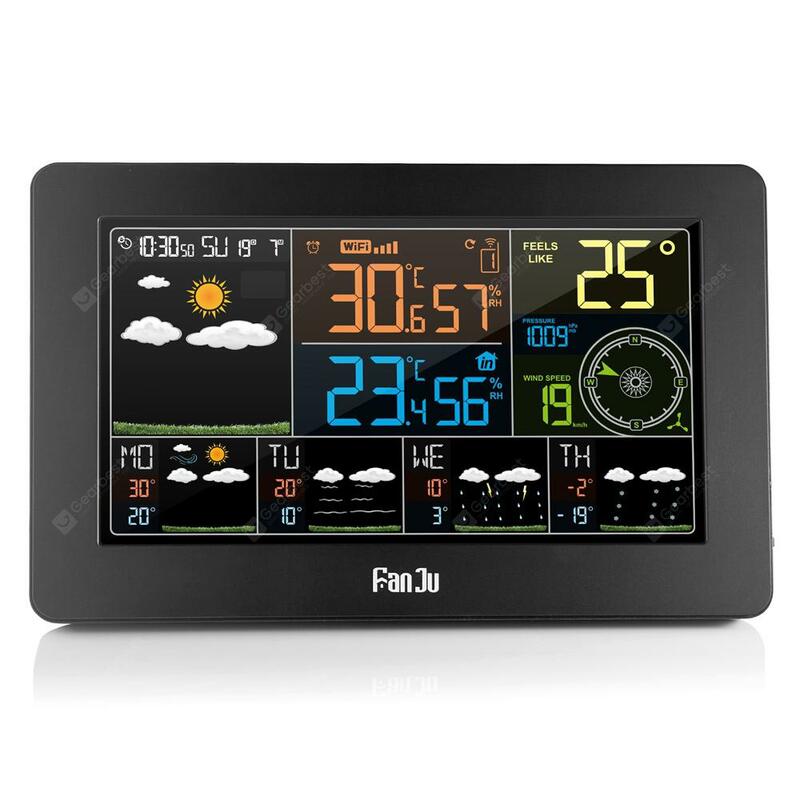 FanJu FJW4 Color Wi-Fi Weather Station with APP Control / Smart Weather Clock - BLACK EU PLUG w cenie $49.99 | Chińskie kupony rabatowe, zniżki i okazje! 2. Easy to Use and Accurate Data: Wi-Fi setting video is included in APP which shows how to connect weather station with your cellphone. After successful connection, the weather station automatically collects time, date and weather data from the Internet which is more convenient and accurate. All data will display with clear big digital number in screen. You can download the free APP on your cell phone to view weather history charts, set temperature and humidity alerts and check weather forecast for the next 4 days. 3. Thermometer, Hygrometer, Barometer and Wind Speed Function: Indoor or outdoor temperature and humidity display in optional C or F. Min/Max display for humidity and temperature. Air pressure, humidity and temperature trend display; outdoor ice alert sounds when the outside temperature is -1 C to 2.8 C. Up to 3 remote sensor channel let weather station to shows 3 different rooms data with 60-meter transmission range in an open area. 5. Dimensions and Power Requirements: About: 20.5cm*3 cm*13 cm; 2 x AA batteries (Not included) or DC power adapter (Included). Use power adapter to keep backlight lighting and 4 level brightness can be set. If use batteries only, it is hard to view the display without backlight and backlight only keep lighting for 15 seconds when touch the LIGHT button. 1.Easy connection between weather station and cellphone with setting video. 2.Data collects from Internet, more convenient and accurate. 5.Time in optional 12/24 hour format. 14.4 levels brightness backlight select with power adapter. 15.Up to 3 remote sensors connect, roasting display 3 room weather data. (Only 1 sensor included). 60 meter transmission range in an open area. 16.Backlight only keep lighting with power adapter. If weather station runs with battery only, backlight only active for 15 second by press the LIGHT button, it may a little hard to see the display without backlight.